I first learned that lesson when we returned to New York City after a year-long absence. During that trip I gained a greater appreciation for the Big Apple, around which I had lived and worked for so many years. This time back, we used AirBnb to rent an apartment in our former hometown of Hoboken, NJ. While we often consider ourselves New Yorkers, we spent most of our adult life living just across the river in New Jersey. For anyone who’s ever been to Hoboken, the confusion is understandable. The city feels more like a borough of Manhattan than a sister of Trenton. When we left Hoboken to travel fulltime, we didn’t think we’d ever return; at least not permanently. We left behind a town we loved but gained the world. We knew if ever we decided to settle down again we’d find equally wonderful, if not better, places elsewhere on the globe. Twenty years was more than enough time in any one spot. Or so we thought. Now, after 142 domestic and 30 international stops, Hoboken finds itself once again atop a very short list of places we’d consider settling. With Manhattan a single subway stop away, I long considered Hoboken an ideal base from which to pursue a career. Now I also recognize it as one of the country’s best places to live. The Mile Square City is nothing if not a playground for anyone who likes to eat, drink and be merry. And who doesn’t, really? Within a mere six block (0.4 mile) walk along Washington Street I counted more than 25 restaurants, not including numerous pizzerias, delis, dessert shops, fast food, and, of course, bars. Offerings ranged from vegetarian to steak houses; Portuguese barbeque to Japanese sushi, American cuisine to French, Cuban to Malaysian, Middle Eastern to Italian, Mexican to Indian, Greek to Thai . . . you get the picture. All within a 10 minute walk and all, or at least most, totally fantastic. 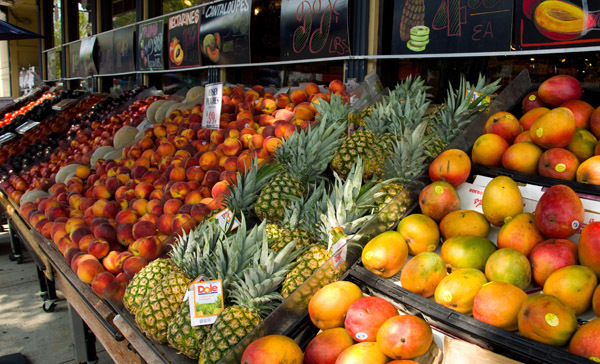 Squeezed between these global food offerings are businesses providing nearly every other service imaginable. We lived in Hoboken for almost ten years before we owned our first car. There is so much available within walking distance that an automobile is simply not necessary. If we move back, we’ll again happily live without one. Filling in the gaps between conveniences are attractive brownstones gracing neighborly tree-lined streets. And parks, an astounding 19 of them, dot this single square mile city. 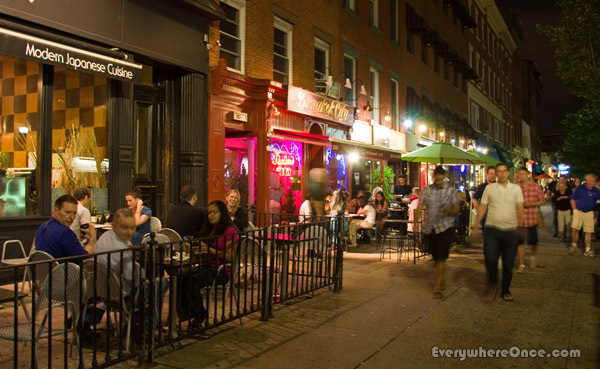 From anywhere in Hoboken a lovely outdoor space is never more than a five minute walk away. And lovely is an understatement. The city has developed several stretches of riverfront into some of the most beautiful parks we’ve seen anywhere. 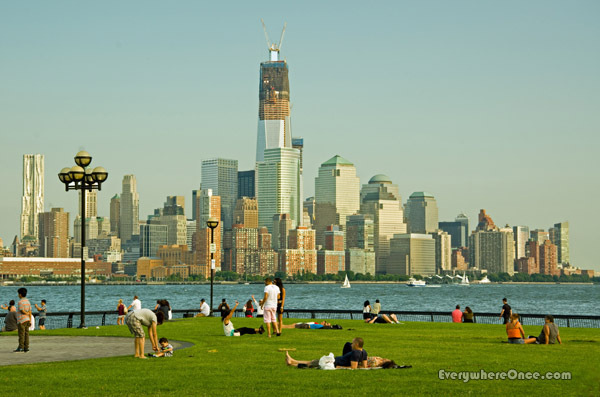 Maxwell Place and Pier A parks are new since we first moved to Hoboken, and have since become spaces we love returning to again and again. The latest addition, Pier C Park, is finally complete and we’re glad to have had the opportunity to see how it turned out. Walking through this uniquely designed promenade and play area convinces us that Hoboken will continue to improve itself every year; just as it has continuously for the past two decades. We’re strong believers that variety is the spice of life. It’s hard to imagine we’d ever want to return somewhere we’ve already lived for so long. But in sampling the world’s offerings, we’re also discovering how singularly wonderful our first home really is. So much so that we really would consider going home again. Love the title of this post. Perfect! I have never been to Hoboken. But your post makes me want to go. And – apropos of not very much – one of my very favourite pieces of music is ‘Night Falls On Hoboken’ by Yo La Tengo. 17 minutes long and, for me, almost impossible to listen to all the way through because at some point it will infallibly lull me to sleep. And I mean that in a good way! Keep up the posts – very enjoyable, not least for someone like me, thoroughly stuck in London. We’ll, london’s not such a bad place to be stuck. Of course there is always the Eurostar into Paris and all of Europe beyond. Thanks for taking a look at my blog…with that said, ur blog is absolutely incredible! I’m still learning how to use wordpress but I hope to learn enough to have it set up as neatly as yours! I love the travel tips and and will follow closely. Thanks a bunch! Welcome aboard. Thanks for stopping by. Very interesting! I’ve been staying at the Jane when I visit New York, but now you’ve got me thinking about Hoboken. There don’t seem to be many hotel options, could you post the link for your B&B? You are correct. The only hotel I’m aware of in Hoboken is a W, which is a bit pricy. We used https://www.airbnb.com/ to rent on a one bedroom apartment while we were in town. 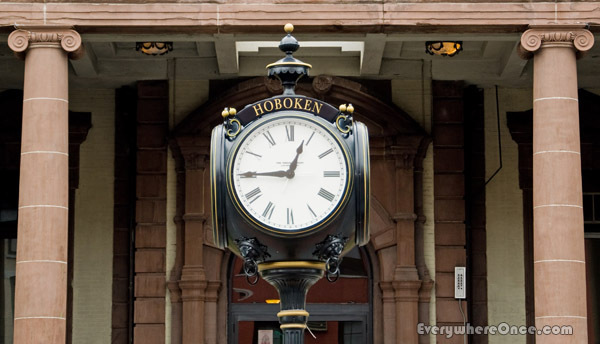 Do a search for Hoboken on the dates you’re interested in staying and see what comes up. It’s worth checking back several times because the listings change regularly. Good luck. Cool thoughts. And a lovely description of your town. If and when I return to the states to live, top of my list would be my old hometown of Wilmington, NC. Yeah, you can go home again. Just not TOO soon! Instead of Trenton, maybe Hoboken should consider becoming a sister city of Denver — the Mile Square City linked with the Mile-high City. It really is amazing how you can see the world, and then, out of all those places you’ve explored and experienced, still call one place “home,” that one place that just tugs at your heart and soul.